It was only my second day in India and I was already wrist-deep in flour learning how to make roti. I watched with rapt fascination as Priya coaxed little balls of dough into perfectly shaped rounds. I tried my best to emulate the fluid motion of her hands, to apply the right amount of pressure and dusting of flour. My roti weren't perfect, but they were good enough for Priya to let me hang out in the kitchen again. I arrived at our first cooking lesson with a notebook and pen, ready to jot down instructions and recipes. 'The most important thing is chopping everything first,' Priya explained as she heated lugs of oil in three big pots and rapidly tossed various combinations of spices into each. 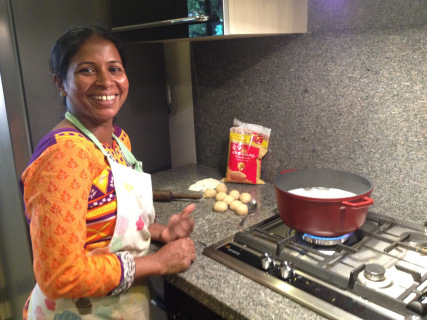 To serve a traditional Indian meal, Priya was cooking several dishes at once; this multi-tasking, and the importance of timing in unlocking certain flavours, was the reason she placed so much emphasis on prep. Before long, all those chopped vegetables had disappeared into bubbling vessels, and I had failed to write down a single ingredient or measurement. Instead, I had learned a little more about Priya. She was a single mother with three children—a difficult situation to face in India, where the cultural norm is to shun widows. Historically, widows were marked by white garments and shaved heads, forced to give up material possessions including their culturally prized jewellery, and sometimes subjected to sati, the old tradition of burning a widow on her husband's funeral pyre. The last reported sati occurred just twenty years ago and I was shocked such practices were the cultural norm within my lifetime. More infuriating is the strong stigma that still plagues widows of present day India—including Priya, who was struggling to enrol her children in good schools because of her martial status. While Priya yearns for rights in an entrenched patriarchy, she is also a symbol of change. She independent earns a living and provides for her chi; she has ditched the more traditional sari fora salwar kameez (loose-fitting trousers and long shirt) so she can steer her motorized scooter through traffic with ease; and she raises her three children without plans to re-marry, abandoning the traditional of a husband as a necessity. After several afternoons in the kitchen with Priya, I had learned that no dish was cooked the same way twice, and any measurements she provided were arbitrary numbers. While this makes it impossible to write a standard recipe, it has provided insight on Indian cooking—or what I fondly call 'the art of not measuring'. Cook 2 cups of rice. In a separate pan, toast some peanuts (no oil needed) then cool and crush (I like to crush half for varied texture). Chop a handful of garlic, two to four onions, some curry leaves, and six to eight green chilli peppers. Juice 7 limes and set aside. Heat a generous amount of vegetable oil in a large pot. When it's 'dancing' (you'll need high heat to make it sizzle) add two pinches of mustard seed. Add garlic, onion, curry leaves, and chilli peppers. Stir on medium-high (if everything is sizzling and smelling fantastic, you're doing it right). When the onions have turned bright white and just started to brown, add peanuts. Fry for ~5 minutes to release flavors. Add a heaping tbsp. of turmeric powder and the lime juice. Fluff the cooking white rice then fold it into the mixture until color and ingredients are evenly distributed (be sure to scoop up all the goodies that sink to the bottom). Garnish with peanuts and lime, serve hot. Bring oil to a high heat. Add mustard seeds, curry leaves, chopped onion and let sizzle. Stir in ginger and garlic (chopped and pestled) and patiently let it all sizzle. Your kitchen should smells strongly of ginger. While the mixture sizzles, blend 1 chopped onion, six to seven chopped tomatoes, 1 small tamarind (optional) into a liquid tomato puree. Line up chilli powder, coriander powder, turmeric powder, and a glass of warm water beside the stove. When everything in the pot is golden, add ~1 tbsp. of chilli, ~3 heaping tbsp. of coriander, a half tbsp. of turmeric powder. Add a splash of water and stir. The chilli spice should tickle your nose. When 'the oil comes' (it will bubble to the surface) add the blended tomato puree to the mixture. Stir and let it bubble. Salt generously (Priya dipped four fingers into a wide jar) then throw a lid on it and 'let it dance' on medium-high heat. If the mixture looks dry, add a little more water. When the pot is bubbling excitedly, add slices of white fish. Add freshly chopped coriander. Toss the first 8 ingredients into a pressure cooker and heat for three to four whistles. Turn off the heat and cool the mixture. In a separate pot, boil chopped radish then add to the daal when it's cool. Salt and add hot water to the mixture as needed to enhance flavour and adjust consistency. Heat oil in another pot and add mustard seed. You should hear it crackle. Add 1 chopped onion, 1 chopped chilli, and curry leaves. Add cooled daal mixture to the pot, stir, and simmer. By the time we left Bangalore, Priya's children were successfully enrolled in a reputable school. Priya's full story has been told on Terry Anne Wilson's blog notesonaboardingpass. As luck would have it, we met some Indian climbers who claimed to know the best restaurant in all of Badami (an off-the-beaten-path town and climbing destination). We followed them into a mint green concrete building, and nearly filled the entire room of four tables and red plastic chairs. This was Sri Veerbhadreshwar. Within minutes, round metal plates were set down before us with a sampling of the day's curries, followed by unlimited roti and chapati, chutneys, and lime sodas. It was only our second meal in Badami, and Sri Veerbhadreshwar became the only restaurant we would visit for lunch and dinner during our entire week of climbing in Badami. Yes, the food was that good. After enjoying a few meals and getting to know the familiar faces running the family establishment, I was invited to hang out in the kitchen. It was a a small 8x8 room where three relatives chopped and stirred in chaotic harmony. I was invited to sit on a low stool beneath a fully-loaded spice shelf, noticing that much of the cooking was done seated on the floor (I saw this to be true in the many other kitchens I poked my head into, from the famous restaurant M.T.R. to a monastery kitchen in the far reaches of Ladakh). The small space seemed bigger from that low perch, and I somehow felt a part of the jokes and laughter that rang overhead in another tongue. And since there wasn't room for anyone else in the kitchen, the husband leaned in through the doorway and listed ingredients in their English name so I could write them down. Once again, the recipe is absent of any precise measurements. It seems that with Indian cuisine, perfect results must be earned through time and repetition as was done by the hands who shared this recipe. Boil eggplant (skin on) in a pressure cooker until soft. Add onion, chilli paste, salt, jeera powder, and fresh coriander and mash it together. Finish with a touch of sunflower oil and black dill powder (the game changing ingredient, a South Indian flavour). Serve with warm roti (or anything you can dip). Interestingly, if you happen to search the restaurant on Google you will find a photo of us! Brown vermicelli noodles in ghee and set aside. Bring other ingredients to a boil. Add vermicelli to the pot and stir. When 3/4 done, garnish with dried fruit (ie. apricot or raisin) and roast nuts (pistachios or cashews). Let it simmer, then enjoy!